A Mediterranean cruise gives glass shop owner Savannah Webb a chance to demonstrate her expertise—and fire up her skills when it comes to foul play . . . When Savannah signs on to perform glassblowing on a ship, part of the appeal is that she’ll get a chance to reconnect with her boyfriend Edward’s family. An added bonus is that Edward’s cousin, Ian, will be joining them on board. But when Ian disappears at the beginning of the cruise, the ship’s authorities initially consider it suicide. Savannah tries to balance her growing suspicions with work on her shows, but her relationship with the other glass artists begins to crack. And she can’t let love color her judgment when Edward suddenly jumps to the top of the suspect list. His fate is in Savannah’s hands, and she’ll do everything she can—on land and sea—to clear his name . . .
Savannah Webb is going on a Mediterranean cruise as substitute crew member. She will be replacing a glass blowing artist. She will be giving demonstrations with two glass artists. Savannah’s boyfriend, Edward and his cousin, Ian are going on the cruise as regular passengers. Edward plans a pre-cruise stop to visit his parents at their home. At Savannah’s cruise ship premier demonstration, two of the Webb Glass Shop students, the Rosenburg twins appear. They decided to take the cruise to attend the glass blowing demonstrations. Ian and Edward’s past catches up with them on the cruise. Then Ian disappears.....What happened to him? Did he fall overboard? The employees from the Webb Glass Shop help from St Petersburg with Savannah’s investigation by email. Detailed descriptions made me feel like I was actually on the cruise ship and at the ports visited. The food sounded delicious that as served on the shipped. It was interesting learning about glass-blowing techniques. A glossary is included at the end of the book that helps the reader with the terms. The characters were all well defined, interesting, entertaining and artfully crafted characters. Murder, past lives uncovered, danger, intrigue and suspense with several twists and turns add to the fast paced plot with sprinkled with some humor and romance. This is book # 5 in the Webb’s Glass Shop Mystery series. It can be read as a stand aflone. I volunteered to read Shattered at Sea. Thanks to the Cozy Mystery Review Crew for the opportunity. My opinion is my own. Blown Glass & Missing Passengers on the High Sea! An exciting addition to the Webb Glass Shop series! Savannah and Edward take the glass show on the road or rather on the ocean so Savannah can participate in a glass blowing extravaganza on the ship! Things start to unravel when one of their circle of pals goes missing and the mystery is afoot from there. Multiple layers to the plot as Edward's seedier past is unveiled and plays a role in the current mystery thus causing some interpersonal issues as well as potentially deadly characters on the horizon! Once again a fun plot woven with mystery, intrigue and well developed characters that you bond with! I'm looking forward to the next adventure in the series and after you read the ending of this book, you will be too! A greatintroduction to glass blowing at sea. How interesting to read about the modifications made to accomodate thw hasards of working at sea. To do all this and to be able to successfully solve the misssing guest mystery is nothing short of miacaulous. Loved it. 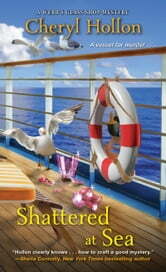 Shattered at Sea by Cheryl Hollon is A Webb’s Glass Shop Mystery. Savannah Webb has been hired to be a replacement glass artist on the Mediterranean cruise ship, Obscura. On route to Barcelona, Savannah and her boyfriend, Edward stop in St. Albans, England to visit with his parents and pick up Edward’s cousin, Ian Morris who will be joining them on the cruise. Savannah is surprised and pleased to see Rachel and Faith Rosenburg on the ship. After getting settled, Savannah introduces herself to the glass blowing crew and settles in for the first glass demonstration. The next morning, Ian has disappeared, and the ship’s security believes he committed suicide or accidently fell overboard. Ian had drunk quite heavily and, according to the twins, Ian was feeling despondent. Edward and Savannah with help from the Faith and Rachel, search for Ian on the ship, but they are unsuccessful. They are certain that Ian is hiding, but they do not know why. Can Savannah and Edward find Ian before it is too late? A Webb’s Glass Shop Mystery series is one of my favorite cozy mystery series. The book is set in St. Petersburg, Florida which is near to where I live. I like reading about familiar sights along with the beautiful creations Savannah makes from glass. The series also contains friendly characters that I enjoy visiting in each new book. Shattered at Sea has Savannah, Edward and the Rosenburg twins, but we only get a glimpse of Amanda Blake and Jacob Underwood. I am happy, though, that the author found a way to include them. I thought Shattered at Sea was easy to read, but the pace was a little slow. Instead of a murder, we have a missing person’s case. Personally, I found the storyline slightly farfetched. I do not want to say too much and spoil it for you. There are a limited number of suspects and identifying the guilty party is unchallenging. There was a lack of tension and suspense. I felt that certain details were off in the book and the resolution seemed incomplete. I appreciated the levity the twins provided to the book and it was interesting to learn about a different method of glassblowing. It was also nice that Savannah was creating glass pieces in this book (back to her roots). I did not like the details Edward revealed about his past and they did not go with his character. My rating for Shattered at Sea is 3 out of 5 stars. If you have not read any of the previous books in this series, I recommend starting with Pane and Suffering. The ending is satisfying and will have leave you smiling. While Shattered as Sea is not my favorite book in A Webb’s Glass Shop Mystery series, I am looking forward to reading Savannah’s next tale.